One of the more challenging parts about executing on a content marketing plan can be coming up with creative social media content ideas that engage your followers. While you may have the best strategy in the world, the actual content creation part can be time consuming and exhausting. We put together this list of social media post ideas to help inspire consistent and valuable content for your audience. Analyzing your Instagram results will allow you to see what type of content works best for your audience, increase your engagement and followers, and ultimately grow your brand. So what should you be tracking? INDUSTRY NEWS: Share stats and snippets of industry research, reports, headlines, etc., to maintain your status as a thought leader. PRODUCT + SERVICE ANNOUNCEMENTS: Whenever you have a new product or service, use social media as one of your strongest tools for announcing it to your audience. Consider creating an entire campaign around your announcement. STAFF HIGHLIGHTS: Use social media to highlight your staff, whether it be new hires or something amazing someone on your team accomplished. COMPANY CULTURE: Show off your company culture on social media by showing photos of your office space, company events, internal campaigns, and more. INDUSTRY OR COMPANY EVENTS: Use social media as a platform to promote upcoming company events or industry events you are attending. CURRENT PROJECTS: Highlight case studies from projects you’re working on and drive people back to your website. CLIENT SPOTLIGHTS: Show off your clients on social media by linking to their projects, blog posts, social media posts, etc. PRESS COVERAGE: Don’t be afraid to brag a little on social media and reshare any press coverage that your company receives. BLOG POSTS: (This is a no brainer.) Share your published blog posts multiple times and in multiple ways on social media. VIDEOS: Get creative and post videos of your team or product. Consider using the Animoto video maker, nicely produced videos, or DIY videos. HOLIDAYS: Celebrate the holidays on social media by posting what your team is up to and how your company celebrates various holidays. HASHTAG HOLIDAYS: There are also a plethora of “hashtag holidays” or “National ______ Day” out there that have been born with the growing popularity of social media. Take advantage of the ones that are relevant to your company and have some fun with it. MEMES OR GIFS: In addition to sharing images, you can also use memes and GIFs to add a fun spin on your social media content. INSPIRATIONAL QUOTES: Pull quotes from industry leaders your audience will relate to and add a little design to your post by featuring a good photo. FEEDBACK REQUESTS: Ask your audience for feedback on your product or service. You can post polls and surveys, or simply ask a question for people to respond to in the comments. Questions increase engagement, too! Q&A OR FAQS: Use the feedback you get to do a post on “commonly asked questions” or consider hosting a Q&A on Twitter or Instagram with your audience so they can get their questions asked in real time. INFOGRAPHICS: Infographics are a great way to share large amounts of information in a digestible and reader-friendly format. Whether you are creating the infographics yourself, or sharing an industry partner’s, they make a great tool for social media. PERSONAL STORIES: Don’t be afraid to get personal. Let members of your team (especially leadership) take over your social media accounts and share personal stories from their day and work. CUSTOMER TESTIMONIALS: Share customer testimonials on social media by creating branded graphics with quotes. QUICK TIPS + ADVICE: Offer quick “how to” tips or videos on a specific topic in your industry. CONTESTS: Running the occasional contest (especially on Instagram) is one of the most impactful social media ideas when it comes to potential engagement from followers. A few things to keep in mind for a successful social media contest: terms and conditions, a point of contact and a creative way to enter. “ON THIS DAY IN HISTORY” POSTS: Find something interesting and relevant to your brand or your city and share it on social media using “on this day in history” as your prompt. EMAIL SIGN-UPS: Find creative ways to encourage people to sign up for your email list. Promote sign-up forms through social media for webinars, events, gated content, etc. COMPANY ACCOMPLISHMENTS: Anytime your company or team member receives an award or accomplishment, share it on social media. This will increase company culture, help with the hiring process, and boost your bragging rights. 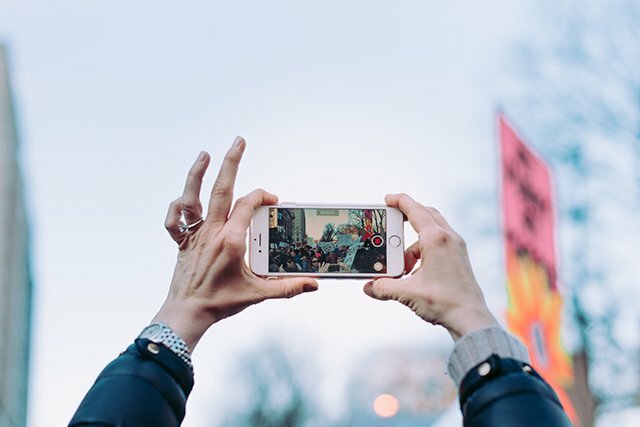 USER-GENERATED CONTENT: Take full advantage of any content other people are producing about your brand or product and reshare it on your social media pages (with their approval, of course). Make sure to share the love by tagging that person in your post. SHARE, RETWEET, + REGRAM: Let your followers do the talking by retweeting, sharing and regramming interesting content from your followers. Give them a little shout-out while you’re at it. COLLABORATE WITH ANOTHER BRAND: Tap into your network of partners and create content together for social media. That could include sharing each other’s content or creating brand new content all together. Look for partners that aren’t directly competitors, but have a similar audience. INTERVIEWS: Conduct a Q&A via Facebook live with an industry leader or influencer — a great way to increase engagement and brand loyalty. ASK FOLLOWERS TO TAG FRIENDS: Post a new product, service or event and ask your followers to tag a friend who might be interested in the news. GO BEHIND THE SCENES: Give your audience a sneak peek of a “day in the life” at your office. What are your favorite social media tricks? What have you seen the most success with on your social media pages? Do you notice when other brands do something out of the ordinary? We’d love to hear from you.